Screen production can be much more than a representational mode; it can be a powerful tool to investigate subjects that are difficult to represent or pin down. It has been theorised that an important feature of the intercultural film is to move beyond the seeable and sayable towards a more haptic experience of the moving image. This paper takes my PhD, an investigation into the body’s relationship to landscape, as a case study to discuss how this practice is not only about stylistic or formal exigencies but that it is also a methodological imperative. I will discuss ways in which the instrument itself, the apparatus (the camera, the moving image, sound) allowed me to venture into intercultural spaces that are marked by experiences of dislocation and by disjunctions in time and space. It was a crisis with image and language that called for knowledges of the body and affective spaces. In this movement beyond what can be shown in clear images or spoken directly, the work required space, physical space outside of the screen. I will discuss how this spatialisation into an audiovisual setting extends the notion of the haptic space of the screen and opens out into the dark and haptic space housing the body of the audience. In this setting the screen becomes a sculptural object, the moving image becomes a body with which other bodies can interrelate in affective ways. This is a mode that can make a condition such that the audience may know ʻwhat it feels likeʼ to enact the making and unmaking of boundaries between self and space, self and language and self and image, and what it feels like to be displaced in this act. Screen production can be a methodological tool that can engage subject matter that might otherwise remain on the level of the subterranean or virtual. This is to claim that screen production is much more than a representational mode, or simply an agent of communication. It can be an apparatus that, through audiovisual means, takes us beyond the seeable and sayable and into the realms of the haptic. This haptic space has close allegiance to poetic structures, structures that support the affective power of that which is invisible or silent. I use my PhD project, Straying and Casting (2014), as a case study to navigate through this theoretical and practical terrain. My PhD enquiry was into the relationship between body and place, and what an audiovisual practice might reveal about this dynamic. I will discuss how the ontological and phenomenological status of the installed moving image leads to insights around an audiovisual approach to ‘what it feels like’ to be displaced. There are two preoccupations here: the first is that the practice itself led to particular discoveries due to the kinds of enactment that took place in the making of the work. The second is that enactments became crucial to the experience of the work, a kind of completion of it by the audience whose bodies in relation to the ‘body’ of the work became crucial. Both of these aspects hinge on the difficulty of speaking about displacement and the need to work within affective spaces and registers that exceed the possibilities of representation but rather work toward an embodied knowing. Both the artist and the audience need space so that the body can move in order to experience/create. The space for both artist and audience is mediated by images, or the making of images. I will discuss ways in which this handling of images can lead to affective experiences beyond the seeable and sayable. Straying is a 48 minute audiovisual installation that plays on a continuous loop. It comprises three video channels and one audio channel. The audio is a voiceover: the tone is intimate, a private invocation; the female voice addresses the moving images that are playing on three screens which hang in the middle of the space. The sound is never diegetic: the voice is bodiless, the images are voiceless. This voice tries to reconstitute her body out of the images; she says: ‘let us brush up against each other’. ‘I am here at your feet’. ‘Enfold me’. ‘Yield a little’. ‘To think it is to become it, to desire it is to be changed’. ‘You remain impenetrable’. The screens on which the images are projected are flexible, sheer, light, ethereal. They hang suspended from the roof. The images are not contained by a frame, they spill onto the surrounding walls or other surfaces. As audience members move around, their silhouettes are inscribed onto the screens and the images that play on them. The images projected on the screens are exteriors, public spaces: basketball courts, playgrounds, rivers, parks and town squares. A reconstitution of the body could also be seen as a dissolution of the self into the images and, perhaps, by extension into the places it depicts. In any case it is a conciliation between image and voice; body and landscape; a mutual embodiment. Figure 1. 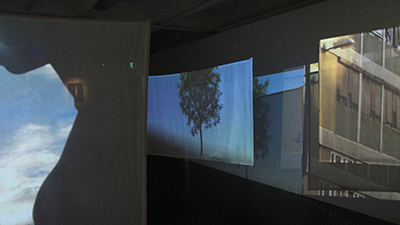 Still from the installation Straying (2014), First Site Gallery, Melbourne. The research project was an investigation into the relationship between body and place. I wanted to make pictures and sounds, contain them in a frame; I wanted to make an auditory and visible manifestation of this relationship. My early contentions were that these internal and external spaces of bodies and places together constitute our sense of place, and our sense of self. These first propositions were grounded in theoretical literature on place, and the depiction of bodies and place in film. Edward S. Casey’s idea of ‘implacement’, which is concerned with the ‘experience of being in (a) place … becoming part of (a) place’ (Casey 2009, 33) provoked me to think about the body’s relationship to place in terms of levels of embeddedness. This conjures, for me, the idea that the space we occupy has a density. Movement through space then has a particular quality and effort which are unique to that body and that space. The imagination, as an important dimension in our conceptualisation and experience of place, is a focus in Tim Ingold’s work on the perception of landscapes: to imagine … is not so much to conjure up images of a reality ‘out there’, whether virtual or actual, true of false, as to participate from within, through perception and action, in the very becoming of things (Ingold 2000). Ingold’s work focuses on the sensing, moving body and its relationship to the environment. But what happens when the body is displaced and is not occupying the environment in order to enact or participate in their mutual becoming? This ‘problem’ also arose out of my analysis of depictions of ‘bodies in landscape’ in the moving image. Filmmakers such as Andre Tarkovsky and Claire Denis both are concerned with ways in which the body moves and inhabits place, however, in these examples it is an achievement in showing ways in which the body finds comfort in these places. Eisenstein’s theorisation of non-indifferent nature (in which he seeks to depict the human as non-indifferent to nature) is perhaps the most explicit example of the treatment of landscape and the body in cinema. Eisenstein was interested in ‘total’ experiences, ones which involved a unity between mind, body and landscape. While these works audiovisually achieve a complicity, or mutuality, between body and place, my intention was somewhat different in that I wanted to find the very boundary between the internal and the external of body and landscape so that I might see ‘the self in the making’. in this aim I would use the poem as artefact. The use of poetry as a tool for achieving these ambitions was born of a double intention and assumption. The premise I was working with was that reciting poetry that lived in the memory of the interview subject would reveal a certain intimate or ʻinnerʼ dimension. Poetry would access these inner landscapes and coax them to the surface, making them available for capture by the camera. The long allegiance between poetry and cinema gave validity to this approach. My initial vision for this work was a single-screen documentary that depicted interviews to camera and recitations of poetry. The interview subjects would also be recorded moving through their familiar, everyday environments. Straying is a work with multiple screens and only one voice – my own – that does not recite poetry and is never visually present in the frame. Other bodies only skirt the edges of the frame, if at all. From this summary description, this installation may sound like a poetry film without poetry, a documentary with no subjects, or an autobiography that keeps the self invisible. The work is indeed about a lot of things you do not see. It is about the body, about sensuality, about poetry, and none of these things are visually or aurally present. The work is marked by absences, the evocation or suggestion of the body, the poem, the personal and the public story. I will share some details of the process so that the ways in which this work was found rather than conceived might become evident. The process of the search was through an enactment that was tied to a screen production practice, and to the ontology and phenomenology of sound and moving image. These practices and features of screen production became integral to the central concerns of the research. I chose to conduct this research in Serbia. The fact that this was my birthplace was not a primary motivator, or at least not the conscious one. What I wanted was to conduct my research in a place where these topics had currency, while not directly interrogating the histories that have given the topics such agency. The poet Adrienne Rich says the body is the geography closest in (2006, 30). One always departs from oneself. Serbia was the place where I could most connect to the ideas around the relationship between the body and landscape. My interest was never to make my own history and experience the subject of the work. I did not want to make an explicitly autobiographical or personal work. I was interested in inner landscapes—but not my own—not as the subject of the research. I wanted to find ways I could access interiorities that I suspected communed in some way with exterior landscapes: a communion that was invisible, but that, with the help of audiovisual representations, I would make visible. ‘The speaking subject is presumed to have known an object, a relationship, an experience that it is henceforth incapable of reconstituting accurately. Why? Because the knowing subject is also a desiring subject, and the paths of desire ensnarl the paths of knowledge… We normally assume the opposite of delirium to be an objective reality, objectively perceptible and objectively knowable, as if the speaking subject were only a simple knowing subject … perceptual and knowing apprehension of the original object is only a theoretical, albeit undoubtedly indispensable, hypothesis’ (Kristeva 1986, 307). If we use the latter part of Kristevaʼs argument to think through its relevance to the documentary, then we might conclude that it is an impossible task to reach the object of truth, with or without the help of fiction or delirium. I recorded interviews, asked for recitations of poetry, and documented the processes. But the interviews did not yield ʻconfessionsʼ or unmediated responses. The poem was not a simple gateway into the private, most personal and emotional world of the interviewee. And the image was not incontestable evidence of the nature of how a body related to the place it inhabited. The documentary and the poem failed. I continued to record, though, following that instinct that Ross Gibson (2014) calls a ‘quickening of the nervous system’, which is the impetus for action prior to a conscious or organised ʻknowingʼ. This ‘quickening’ moved me towards recording empty spaces and landscapes, places that implied bodies or things that had the potential for movement (for example building facades that held the promise of a window opening or shutting, or statues in human form). The voice-over says: ‘Let us brush up against each other. Will you speak? You don’t have to’. The fieldtrip to Serbia lasted four and a half months. I returned to Melbourne with a bagful of footage to start the editing process. I did not feel I was coming back with a project but simply with fragments testifying to my failures. I did not feel I had answered any of my initial questions around the conciliation of the body and landscape. I had not seen any internal or external landscapes ‘touching’. I cut together the interviews I had conducted but they did not achieve the kind of poetic expression I had worked towards, one that was revealing of ‘deeper truths’, representations I had expected to speak eloquently and boldly. The positive value of these failures emerged through a re-casting, of not only the footage, but my entire experience as practitioner/researcher in light of Marks’ study on intercultural cinema. My practice as an artist/researcher had taken place in an intercultural space. The significance of this allowed me to accept the relationship between the experience of making, as well as the consequences of these processes (the footage). In light of this reframing the bagful of fragments now spoke of displacement and dislocation; the very inability to compose an idealised co-constitution of body and place pronounced itself as the subject of the research. Marks identifies the intercultural film as one that necessarily must reach towards expression of that which is outside the ‘seeable and sayable’. She adopts this expression from Foucault, and Deleuze after him, to articulate the way in which the representation of experience is always bound by discursive practices of the seeable and sayable. The two cannot be reduced into one and the same but rather confront each other as ‘two incommensurable forms of truth’ (Marks 2000, 30). Marks identifies the gap between the two truths as the space of the intercultural film, where ‘to read/hear the image, then, is to look/listen not for what is there but for the gaps … to look for what might be in the face of what is not’ (2000, 31). The diasporic experience hinges on “violent disjunctions in space and time” where places, memories and people are unavailable for representation (2000, 1). In the desire to bridge this disjunction between space and time, I started to speak to the images that I could not understand, images that were failing their representational role. I thought that in speaking to the clips, they might speak back: the language might mine the image for significance. The work was now quite explicitly becoming about searching, about mourning, about attempts at articulation that end in ellipses and are never quite fulfilled or expressed. The relationship that was established between the voice and the image started to undo the borders that may have existed between process, theory, reality and imagination. The work found itself at the intersection between the theoretical and philosophical aspects of the research and the experience of gathering the audiovisual material for the creative project. The voice-over says: ‘A thought is either being born or dying. Exposing, or sealing it off. Watch the light refract. What I would like is for you to tell me everything you remember. I want to know what it was like. You can say “as if…”. And I’ll say “what if…”’. This process revealed that the compass of the story was much larger than I had anticipated and that there were further layers to discover, much beyond the images that I had taken. This work was not only about capturing and putting images together. The images were only one step in a much larger process. This extends Rouchʼs wonderful notion that ʻthe eventʼ is unlatched at the meeting of the filmmaker and subject at the moment of recording (Rouch 2007). In this instance to work with the moving image is not only about using the camera to precipitate something in the pro-filmic event and then simply record it for presentation. The footage, once taken, can serve further to guide a deeper investigation. Intercultural films have to go beyond what can be shown in clear images or spoken directly and find a new language. This new language, according to Marks, exists in the other sensual registers and it is to these registers that the intercultural films appeal. In particular, Marks is interested in the sense of touch and how diasporic films turn to a ‘haptic visuality’, a seeing close to touching, in order to find expression. We must turn to sensory experiences of place because they are otherwise not available, they are silent and absent, because to the diaspora they exist only in the realm of memory. We must turn to the ‘knowledges of the body’ (Marks 2002, 5) in order to find expression of them in an audiovisual mode. To express these ‘silent registers’ (2002, 5). Marks claims, the projection screen starts to become like skin. The audience is moved to touch the image with their eyes: it evokes a physical, sensory response. The phenomenological turn in this research happened quite by accident, or by necessity. This turn focused on the audience and how they might be moved to experience this sense of place that is full of breakages, errant experiences, lacks and excesses. Anne Rutherford’s study (2011) of the phenomenology of cinema spectatorship is particularly cogent in the way she privileges the idea of mimeses in the conception of embodied affect. Rutherford’s aesthetics of embodiment rests on ‘the relationship between vision and the body, the role of movement and tactility in that relationship, and the connection of this complex to affective experience’ (2011, 151). This connection between the perceiver and perceived is a ‘palpable sensuous connection between the very body of the perceiver and the perceived.’ (2011, 159). This connection between the perceiver and perceived is ‘a porousness between one’s self, one’s own body and the objects or images of the world’ (ibid). This ‘porousness’, or ‘haptic visuality’, is a ‘sympathetic vibration’ with some part of the image that connects to a bodily understanding or knowledge of that quality in the image (ibid). As I moved into this new space of the research, this re-orientation, I returned to the poetic to help me navigate the ʻdarkerʼ more ʻhapticʼ intercultural space. This time I do not mean the poem as artifact, but rather a poetic structure, that which, after Blanchot: ‘belongs to flesh and breath’ (Bruns and Blanchot 1997, xiv). Again this was a promise of access to that which sits below the surface of things, where we might find a ‘staging of appearance as disappearance’ (Barthes 1975, 10). Note the words: access, permission, disappearance. A word that is missing from this list might be: subterranean, with its synonyms of: private, secret, underfoot, sunken, buried. I like that there is an evocation of earth and water in this list. Fathomless and yawning—as in a yawning abyss—could also be added to our list of words about the poem. Many of these words summon imagery related to landscape, to a physical manifestation, an opening, a thickness. The purpose of this word play is to gesture towards the expansive field that we might call the ʻpoeticʼ and how features of this field chime with some of the central preoccupations of the research project: landscape, absence, possibility. Maya Deren makes the link between the image, the poetic and the haptic in her theorization of cinema as that which can evoke “what it feels like” (Deren 1971, 174). Structure is at the centre of Derenʼs conceptualisation of how poetry works in the cinema. This, for Deren, is essentially a question of time and the nature of its unfolding. By suspending linear time, one has access to exploring a single moment more fully. It ‘probes the ramifications of the moment, and is concerned with its qualities and its depth’(1971, 174). In Derenʼs single-screen cinema works, she makes ʻspaceʼ (depth) through time (duration); by suspending linear time, she ʻdwellsʼ on a single moment. This ʻdwellingʼ is an access to the emotional register of the work. This is something like the pregnant moment. For Barthes, the pregnant moment has implications for the flow of time. It is a moment when the present, past, and future find expression in a single instant: ‘the pregnant moment is just this presence of all the absences (memories, lessons, promises)’ (Barthes 2010, 142). A hiatus or suspension in the flow of time breaks its linear progression. In this hiatus our experience of space is transfigured by the ‘presence of all the absences’. This is like a spatial opening into a single moment of time. This image implies a dwelling space, which is literally the turn made in my research: into the space of the installation. Figure 2. 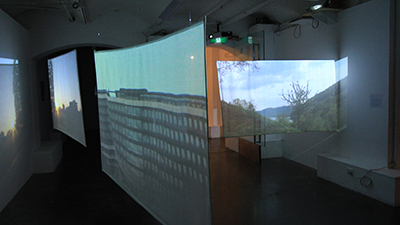 Still from the installation Straying (2014), First Site Gallery, Melbourne. The space of the installation ʻholdsʼ the audience, takes them into its orbit and invites them into the work itself. The space of the installation is a performative space, where the audience and the artwork perform their interaction. This is also a poetic space, in terms of its architecture. Catherine Fowler, in her work on gallery films, also evokes Deren in order to illuminate how the gallery film can directly enact, or spatialise, the notion of ‘vertical time’ (Fowler 2004). The linearity that binds cinema is immediately ʻresolvedʼ in the installation setting, which is to say: it is not bound by a linear imperative (there is no designated ‘order’ with which the audience is to engage with the various elements of the work). The spatialisation of vertical time is critical to Straying. What I have been calling ʻthe pregnant momentʼ becomes a ʻplaceʼ in which the audience can dwell. Multiple times, histories and experiences are literally and physically hanging around the audience in the room, by virtue of the multiple screens. This is a process that might give rise to the creation of a density that becomes palpable to an audience member as moving through this dark, poetic space. It might arouse their sensitivity to the quality of their embeddedness. The voice-over says: ‘I want the colour of my voice to be the colour of the sky. I want the quality of that light to fill all my words, as if they were vessels and the light was a solid. I want everything in this moment to be in the way my sentence falls from my tongue. To re-articulate you. To imitate you in tone. A re-iteration, a reconstitution’. The voice speaks with urgency, not to tell a story, but to piece her own body back together. Part of this reconstitution of the body is a search for a closeness to the places playing on the screens. The voice wants to touch the screen, because the screen is like the skin of the landscape. But more than this, the voice yearns to be enfolded into the screen; she is looking for a place she can embed herself. The ʻwhat it feels likeʼ of poetry, or the poetic audiovisual work, in this instance, is about enabling the audience member to enact, physically, the articulations that the voice performs in relation to the image. That is to say: the audience also enacts a search to reconcile the dissonance between sound and image, time and space. What facilitates this act, or re-enactment, is the way in which the arrangement of the screens in Straying transforms them from simply projection surfaces into ‘sculptural objects’ (Fowler 2008, 253). This has direct bearing on the creation of an affective space for an embodied experience for the audience. The projection screens are part of the creation of ‘resonance’ so crucial to the experience of affect. The screens become ‘bodies’ in the sense that Gregory J. Seigworth (Gregg and Seigworth 2010) defines a body in his rendering of affect; where affect is not only a sympathetic reverberation but also a disconnection and body is a kind of conduit towards affective experiences. Hence affect accumulates across both relatedness and interruptions in relatedness, becoming a palimpsest of force it encounters traversing the ebbs and swells of intensities that pass between ‘bodies’ (bodies defined not by an outer skin-envelope or other surface boundary but by their potential to reciprocate or co-participate in the passages of affect). Bindings and unbindings, becomings and un-becomings, jarring disorientations and rhythmic attunements. Affect marks a body’s belonging to a world of encounters or a world’s belonging to a body of encounters but also, in non-belonging (Gregg and Seigworth 2010, 171). In relation to Straying, Seigworth’s argument is compelling because it articulates the very condition I intend to create with the use of the screens. Of course it is not the screens alone, but also how the voice does, and does not, address them. The screens are a boundary that separates and unites, binding and unbinding, a border and a conduit. In this dual role, the notion of the internal and external is complicated; in this ‘world of encounters’, we are always making and unmaking boundaries. The screens in this kind of world are like windows opening onto an external world, but they are also like a boundary that keeps us on the outside of another interiority. In this perpetual movement, the internal and external are not stable entities; this is the space of co-mingling. The screens hang in the middle of the space where the frame of the screen becomes an important boundary between off-frame and off-screen space. The screens delineate a physical boundary between spaces, a boundary that is encountered with the body. The frame becomes an ‘axiomatic point of tension’ (Fowler 2008, 255) between the off-frame space (material space around the frame: the space of the gallery), the off-screen space (the imaginary or fictional field suggested by the work) and the actual space on the screen, the moving image space. The off-frame space is ʻactivatedʼ, but its significance is dynamic and changing. This is brought about in the relationship between the sound and image: in the way in which the voice vibrates in the space of the installation, in the way she speaks directly to the images, and to the screens. This is important in the creation of multiple spaces and ways of dwelling in those spaces. It focuses the audience interaction between physical bodies, screens of the imagination, remembered landscapes. The effect of these ‘axiomatic points of tension’ is that the space of the gallery becomes a liminal space, or a simultaneously outside and inside space. The screens are deliberately sheer, light, ethereal. They hang suspended from the roof and are of a size that does not overwhelm. As audience members move around, their silhouettes are inscribed onto the screens and the images that play on them. Their bodies are there and not there. Again it is an iteration of an in-between space, on its way from, and towards, someplace else. That the audience has a crucial role to play in the experience of the work is partly foregrounded by the fact that the work can never be seen clearly in its entirety from any one vantage point. The audience continually has to make decisions around what to see from which position in the room. The audience itself is in essence ‘editing’ the piece, making connections between the screens and making connections between the sound and image. Perhaps this liminal, active space is one of easy transformation. Perhaps the audience finds this ease and finds easy transport from their own dream spaces, memory spaces or imagined space. The audience could be seen as rupturing the space between voice and image; placed quite literally right into the middle of this relationship. The re-constitution of the self through the image is fraught, tenuous. But the role of audience members is not only to rupture, they are also the only ones that are able to suture this splintered self. They can be said to be making and unmaking their own relationships with these places, these images; it is as if the voice that vibrates in the room is their own voice, vibrating in their own bodies – the geography closest in – the most intimate and private of spaces. These possibilities for enactment of the making and unmaking of the self in relation to place, to image, is specifically enabled through the use of the screen as object and through the explicit use of the limits of the screen frame. The work as a whole, in the traversal between these various spaces, asks: how might these images alleviate feelings of displacement, loss and mourning? Figure 3. 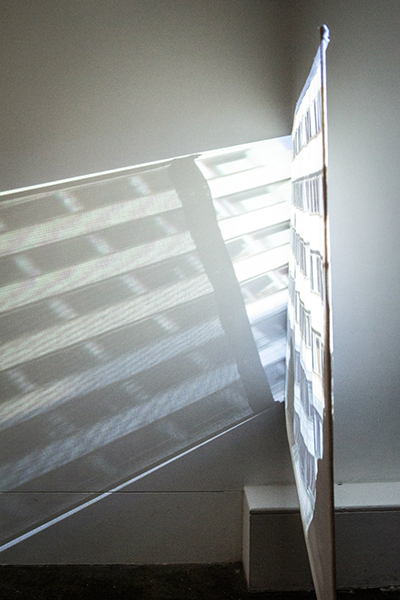 Still from the installation Straying (2014), First Site Gallery, Melbourne. The installation context enacts and extends Marksʼ ideas around how the disjunction between sound and image is an interplay between the seeable and sayable which approach ‘each other asymptotically, showing each other to be false even as they require each other to be true” (Marks 2000, 30). There is a dependency between image and sound even while they displace one another. The crisis is with language and with image as each displaces certainty and truth in the other. The voice in the installation reaches towards the image, and the image towards the voice. Both look for one another, seek each other so that they might affirm memories, might fulfil or complete desires, bodies, selves. For Marks, the third space between image and sound is the space of touch. But she is writing figuratively; the third space is evoked as a subjective experience. The individual cannot dwell (i.e. be physically immersed) in this third space as it is theorised by Marks (2000). The installation, however, sets up a space that is both concrete (a place where we dwell) and this other figurative space between sound and image. The audience is physically thrust into the unstable, unidentifiable place where meaning has to be continually made in the interstices of what can be articulated. It is the space of both unity and fragmentation, enmeshing and instability; a continual negotiation between body and place. The image persistently escapes the voice; the voice would colonise the image. According to the voice the images are not fulfilling their representational power; she cannot find herself depicted in the images, she cannot find any trace of her own history there. The images do no show what she speaks, they do not cooperate on the level of representation. The dissonance in story becomes a dissonance in time and place, a difficulty in pinpointing any stable ʻcharacterʼ, event or place. ʻSpeaking toʼ the image is precisely the act I performed as researcher when I could not make sense of the images myself. This difficulty, this crisis with the image on the level of producing the work has obviously been thematised. The voice speaks to the images, almost obsessively, to rescue them from passing out of being because, perhaps, on the second or third or fifth viewing she might just catch a glimpse of what she desires. The voice-over says: ‘I went to street corners, and fields, attended to flowers, and rivers, with such attention, I learnt all their rhythms by heart. No one has ever loved this place as I love it. No one has ever made such a loving record of its squares and monuments. That’s a lie. These records are only consequences. At some point we must acknowledge that these are all apparitions. Not just sight, but sound. If there are repercussions for seeing, which there are, are there repercussions for listening?’ This becomes a question of the ontology of the moving image: what is the relationship between the image and the reality it depicts? This question can be framed in terms of temporality: on the one hand, the photograph depicts an object as it was in a past moment. At times this is the perspective articulated by the voice: it seems she has taken these images in order to preserve the places depicted in them. She has preserved them so she can keep returning to them in order to reconstitute her self in relation to the past that the images represent. We might identify a pathos in this relationship between voice and image if we look to Bazin (1960) in his seminal work, The Ontology of the Photographic Image: ‘we no longer believe in the ontological identity of model and image’, a ‘preservation of life by a representation of life’ (1960, 5). The voice is reconstituting herself out of an impossibility, a past reality. Even in recognition of the photograph as an artefact depicting a reality in the past, the image fails the voice. On the other hand, we might consider the claim by Bazin (1960) for the photograph as having a positive value, an agency in the present as something more than a depiction of a moment past. According to him, a photograph ‘affects us like a phenomenon in nature, like a flower or a snowflake’ (Basin 1960, 7). The photograph is an ‘increase’; it does not serve the purpose of representing the subject depicted in it, but is rather a thing in itself, has the power of beauty as photograph, not as representation of the beauty depicted; ‘photography actually contributes something to the order of natural creation instead of providing a substitute for it’ (Basin 1960, 8). This ‘implies the possibility of forming relations to objects in photographs that are not possible with respect to objects in the world’ (Morgan 2006, 452). If we consider the image as an ‘increase in being’, then the images might reveal what is otherwise unavailable to experience. The voice has taken these photographs because they may give her access to places which she otherwise would not have. The images might act as a conduit towards the place the voice desires to inhabit. Of course, I could write this in first person, rather than third person, and would then be articulating the passage of the research itself. Bazinʼs concept of ‘transferal’, where some level of reality is transferred onto the image, can perhaps go the other way too: the level of reality that is the ʻincreaseʼ in a photograph can be transferred onto our physical reality. For Straying the implication is that if the voice can affect the image, then perhaps she can also affect her relationship to the place, i.e. the reality that the image depicts. But the images do not cooperate, they come, they go, they turn to black, they do not seem to ʻhearʼ the voice and her plea. These shifts in perspective and consideration of the moving image and its relationship to reality are enabled by the installation setting, where the image is an object, a boundary, and a space of immersion. We might consider that, in this making and unmaking of various relationships to the image and hence to reality, and if this new association to the image is also transferred to our reality, then the experience the audience has been, in the installation space, going on this same journey of making and unmaking relationships to the image. For the audience members this journey, maybe, changes their own relationship to reality: new knowledges, new awareness of place and how we constitute ourselves in terms of it. This movement between various orders of reality, between the ontological ambiguities of the moving image, is a productive difficulty. It precipitates questions around what orders of reality constitute our experience of place. Figure 4. Still from the installation Straying (2014), First Site Gallery, Melbourne. I found that with the installed moving image I could make a condition such that the audience may know ʻwhat it feels likeʼ to enact the making and unmaking of boundaries between self and space, self and language, and self and image, and what it feels like to be displaced in this act. The relationship between the moving image, sound, and space is a fragile one, one that must also make room for the body of the audience, which is instrumental to the meaning-making, a meaning-making that is on the level of the felt. Coming to understand the moving image beyond its representational attributes was a crucial turn in the research project. Further to that was how the installed moving image, and its relationship to space and sound, can create affective experiences. In Straying the audience hears the voice-over say: ‘The skin is the boundary which needs to be crossed. An image only half conjured’. An audience member may be watching the image of the statue. The question arises: why only a ‘half’ image? The audience is invited to complete the other half, the other half of the meaning. Or another audience member at this same moment might be drawn to walk toward the image of an empty court. Another kind of space to be crossed, the body in the installation enacting what the image is calling out for. The voice-over says: ‘There are many moments I could go back to. They are like objects I can hold in the hand, spin around, and describe exactly what I see. But it means nothing to you for me to recount every object in the room, to spin it around, and describe its shape. You can’t decant everything’. She uses the second person, implicating the audience. She is also implicating these screens as the objects that she confesses will always be insufficient. But the audience does not only have eyes with which to see but also bodies with which to create and close distances between themselves and these memory objects. The installed moving image disturbs and challenges both its ontological and phenomenological status, partly through its relationship to sound, and partly through the architectural and sculptural features that create a direct and concrete relationship with the bodies of the audience. This disturbs and challenges how the body and place respond to one another. 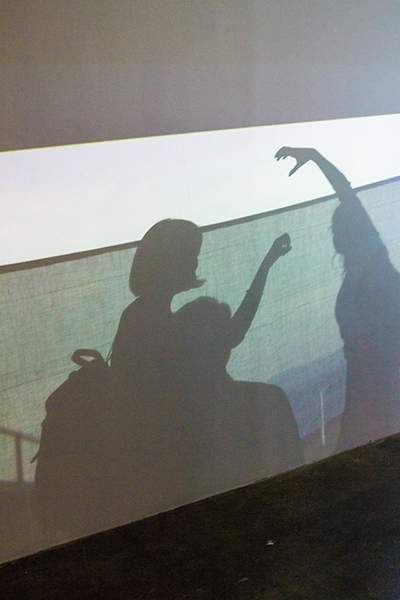 The embodied experience of the audience is not only significant on a phenomenological level, it may manifest in such a way that their own bodies mark the space, contribute to its making, as they move, gesture, sit or stand, look at or retreat from the screens; inscribing them with their own shadows, moving toward, away, touching, making them sway. The practice itself led me to my subject that was not only about the relationship between body and place but also about the more murky space of dislocation and displacement. The instrument itself (the camera, image, sound) led me to a place beyond the seeable and sayable, to a place difficult to represent, toward a more haptic elsewhere. The voice-over says: ‘We watch this image for the tenth time now, and we will keep watching it. Repetition turned to incantation. I imagine it as a whirling dervish’. Barthes, Roland. 1975. The Pleasure of the Text. New York: Hill and Wang. Barthes, Roland. 2010. “Diderot, Brecht, Eisenstein”. In Behind the Fourth Wall: Fictitious Lives – Lived Fictions, pp.139-145, edited by Ilse Lafer. Wien: Generali Foundation. Casey, Edward S. 1997. The Fate of Place. Berkeley: University of California Press. Casey, Edward S. 2009. Getting Back into Place. Bloomington: Indiana University Press. Deleuze, Gilles. 2002. “The Actual and the Virtual.” In Dialogues II. Rev. ed. Trans. Eliot Ross Albert. New York and Chichester: Columbia University Press. Denis, Claire. 1999. Beau Travail. [Movie: 92min.] France: La Sept-Arte, S.M. Films, Tanaïs Productions. Maya Deren. 1971. “Poetry and the Film: a symposium.” In Film Culture: An Anthology, edited by Sitney, P. Adams. London: Secker & Warburg. Eisenstein, Sergei. 1979. Que Viva Mexico! [Movie: 90min.] USA: Mosfilm. Eisenstein, Sergei. 1987. Nonindifferent Nature. Cambridge: Cambridge University Press. Glisovic, Smiljana .2014. Straying. [Audiovisual Installation]. Melbourne: First Site Gallery, RMIT University. Glisovic, Smiljana. 2014. CASTING: Hybrid Approaches to Understanding the Dissolution of the Body into Landscape and Landscape into Body. PhD Thesis. Melbourne: RMIT University. Gibson, Ross. 2014. Keynote Address. Sightlines: Filmmaking in the Academy. [Festival-conference] November 24- 25. RMIT University Melbourne: Screen Cultures Research Lab and the Australian Screen Production Education & Research Association (ASPERA). Janowski, Monica and Tim Ingold, eds. 2012. Imagining Landscapes. Surrey: Ashgate Publishing. Kristeva, Julia. 1986. The Kristeva Reader. (edited by Toril Moi). Oxford: Blackwell Publishing. Lessing, G. E. Laocoön. 1970. Letchworth: JM Dent and Sons. Levy, Pierre. 1998. Becoming Virtual: Reality in the Digital Age. New York: Plenum Trade. Marks, Laura U. 2000. The Skin of the Film: Intercultural Cinema, Embodiment, and the Senses. London: Duke University Press. Marks, Laura U. 2002. The Skin of the Film: Intercultural Cinema, Embodiment, and the Senses. Touch: Sensuous Theory and Multisensory Media. Minneapolis: University of Minnesota Press. Morgan, Daniel. 2006. “Rethinking Bazin: Ontology and Realist Aesthetics.” Critical Inquiry 32: 443-81. Olwig, Kenneth R. 1996. “Recovering the Substantive Nature of Landscape.” Annals of the Association of American Geographers, 86 (4): 630-53. Rich, Adrienne. 2003. “Notes Towards a Politics of Location.” In Feminist Postcolonial Theory: A Reader, edited by Sara Mills and Reina Lewis. Edinburgh: Edinburgh University Press. Robertson, Robert. 2011. Eisenstein on the Audiovisual. London: I B Tauris. Rouch, Jean. 2007. “On the Vicissitudes of the Self.” In Reverse Angle, Cinema and Anthropology, edited by Andy Davies and Nuria Rodriguez. Madrid: La Casa Encendida. Rutherford, Anne. 2011. What Makes a Film Tick? Bern: Peter Lang. Tarkovsky, Andrei. 1962. Ivan’s Childhood. [Movie 96min.] Soviet Union: Mosfilm. Tarkovsky, Andrei. 1972. Solaris. [Movie 167min.] Soviet Union: Creative Unit of Writers & Cinema Workers, Mosfilm, Unit Four. Tarkovsky, Andrei. 1983. Nostalghia. [Movie 125min.] Italy: Opera Film Produzione, Rai 2, Sovinfilm. Tarkovsky, Andrei. 1986 (2008 reprint). Sculpting in Time. Austin: University of Texas Press. Taussig, Michael. 1993. Mimesis and Alterity. London: Routledge. Sitney, P. Adams, ed. 1971. Film Culture: An Anthology. London: Secker & Warburg. Vertov, Dziga. 1984. Kino-Eye: The Writings of Dziga Vertov. California: University of California Press.